This malnourished baby awaits death. What happens 119 days later is crazy! Stephanie Smith-Justus works at a no-kill shelter in the United States. That means that at her animal shelter no dogs are put to sleep, just because there is no space. This, however, is not always the case in the United States. Many dogs in animal shelters are faced by death after a stay of 7 days, particularly when the chances of adoption are very low. In May 2015, Stephanie received a phone call from a worried neighbor. He had just seen a dog that couldn't get much worse and didn't know what to do. Stephanie and her husband reacted instantly: they drove to the place where the neighbour had seen the dog. 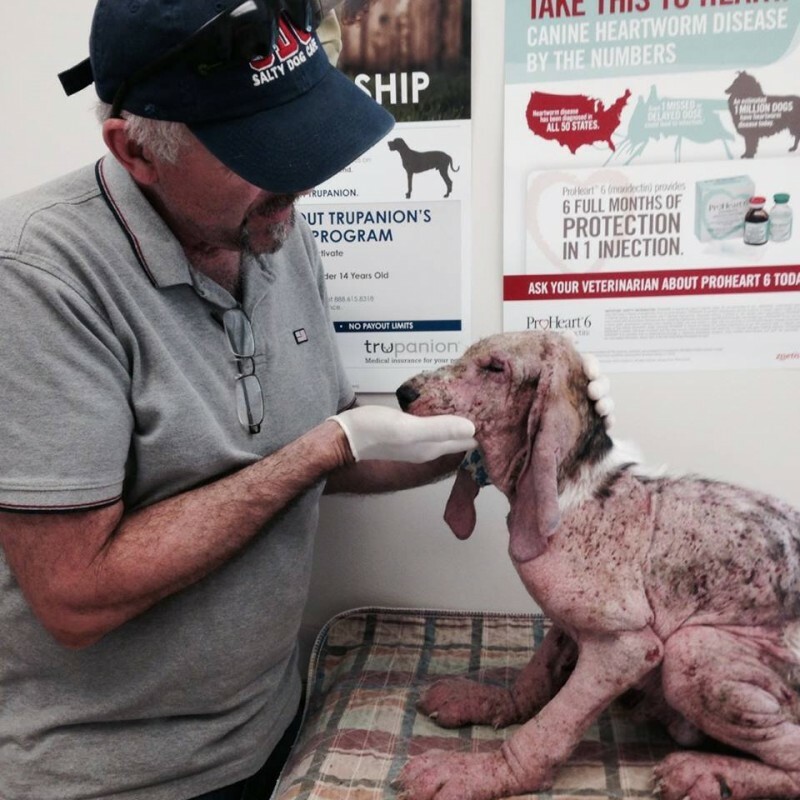 Their years of experience with neglected dogs, however, could not have prepared them for what they were about to see. After hours of searching through the woods, they were about to give up. But then they suddenly discovered the furry friend. The dog was lying amongst the weeds at the end of a street. 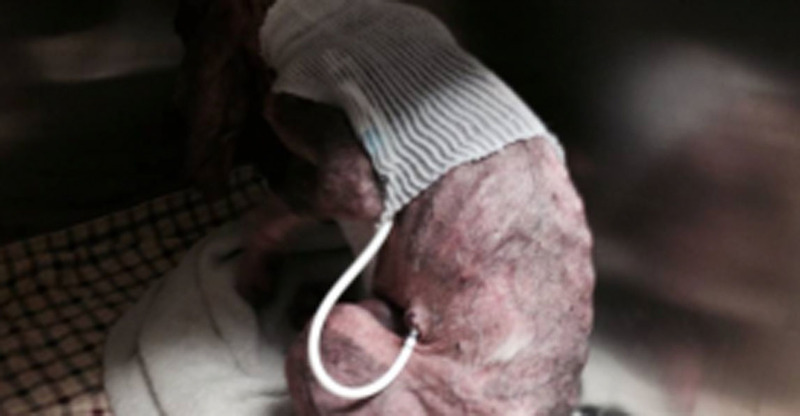 When Stephanie's husband saw the dog, he said: "Stephanie, I don't think this dog will survive." As they looked more closely at him, they believed that he'd had boiling water poured over him. 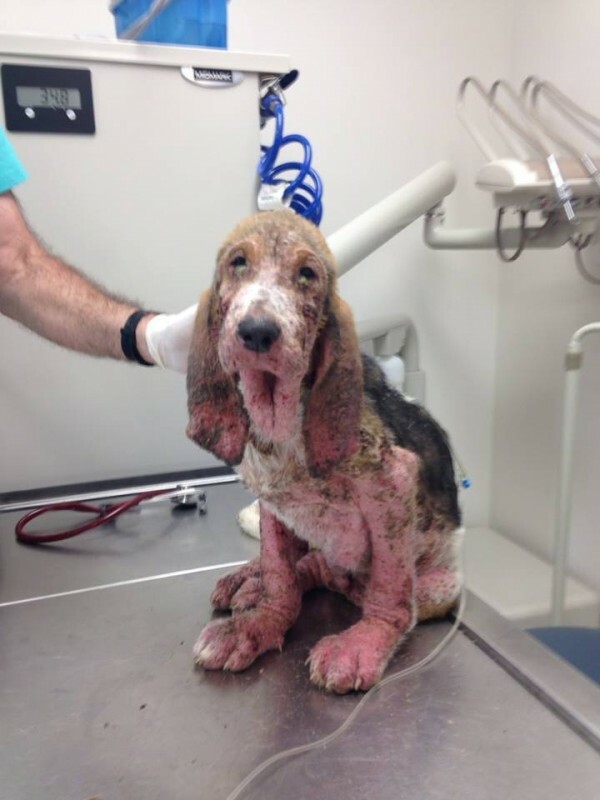 Even though the puppy is just 4 months old, he is covered with the worst case of demodectic mange, a severe skin disease, that they have ever seen. It's possible that he was infected by his mother. "It was so bad," said Stephanie, "it would be like getting second-degree burns." Stephanie and her husband were lucky, despite the situation. A vet had just moved in nearby and Stephanie picked up the small dog and ran as fast as she could. "I didn't even knock," she said. "I just ploughed into the practice." The veterinarian only needed to glance at the dog and knew instantly that things didn't look good. "The vet told me that the dog was dying." But Stephanie refused to give up on the little bundle without fur. She called him Watkins and took him straight away to a bigger clinic. There it became clear, however, that his skin disease war just the beginning. Someone had also shot the helpless animal with an airgun. 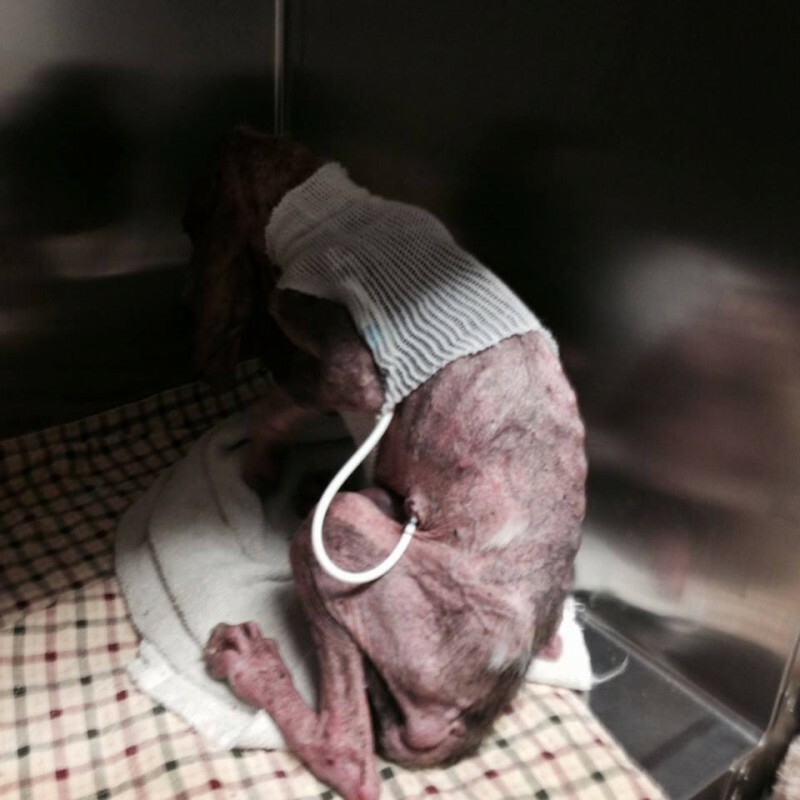 He weighed just over 30 pounds and was so undernourished that his digestive tract had collapsed. 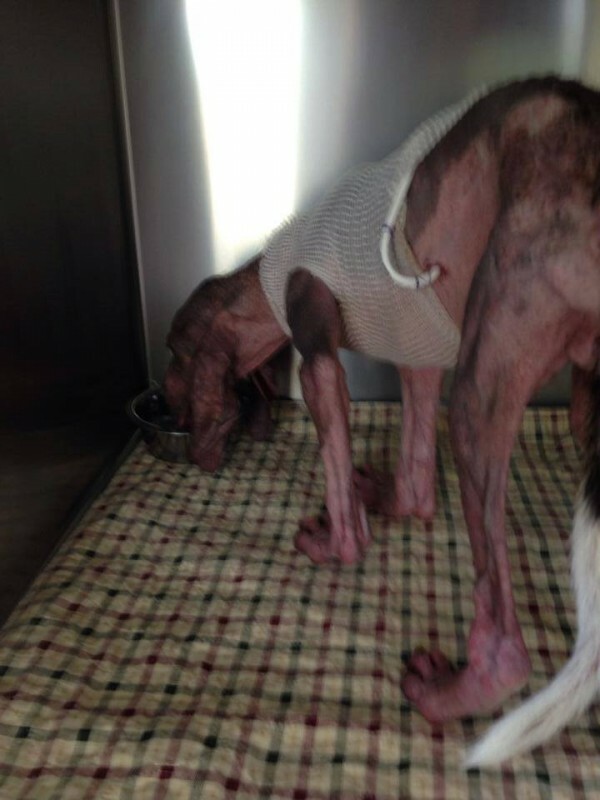 Because of his undernutrition, his joints had not properly developed. They had become completely stiff and Watkins had trouble walking. "His tendons seemed to had lost their elasticity," explained Stephanie. "He couldn't stand unassisted on his own paws. It was too much for his joints ... it was terrible to watch him walk." The demodectic mange had wracked his body so badly, that his body threatened to collapse under him. "He was completely swollen and liquid came out of everywhere," describes Stephanie. 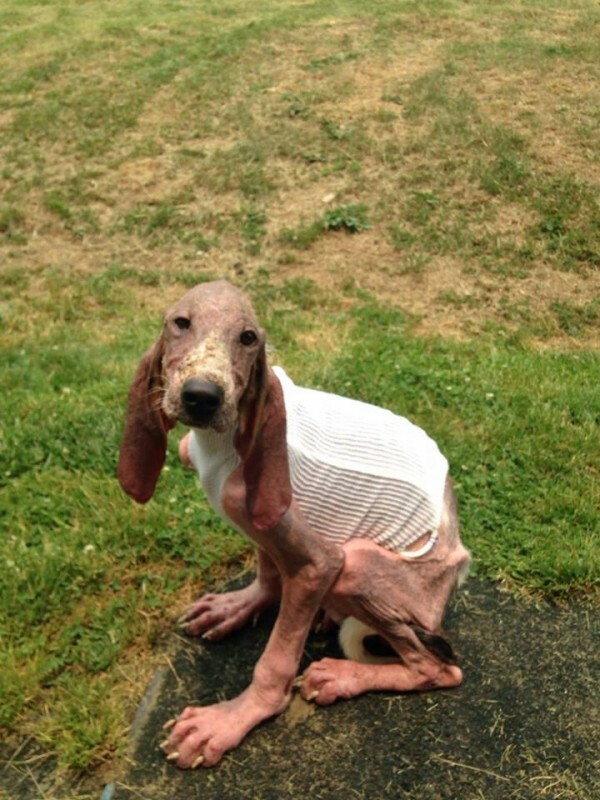 Stephanie saw that the dog's condition was so poor, that she even had to think about putting him to sleep. "I wanted the best for him," said Stephanie and after some careful consideration she made the decision for his life: "We'll save him." But it was clear to her that it wouldn't be easy. Due to his intestines, he needed surgery and the surgeons didn't believe that Watkins would survive the operation. "I had said goodbye to him," said Stephanie. "but the next morning he was doing really well." But it wasn't over yet. He lost another 15 pounds kilo and he bit off his feeding hose. 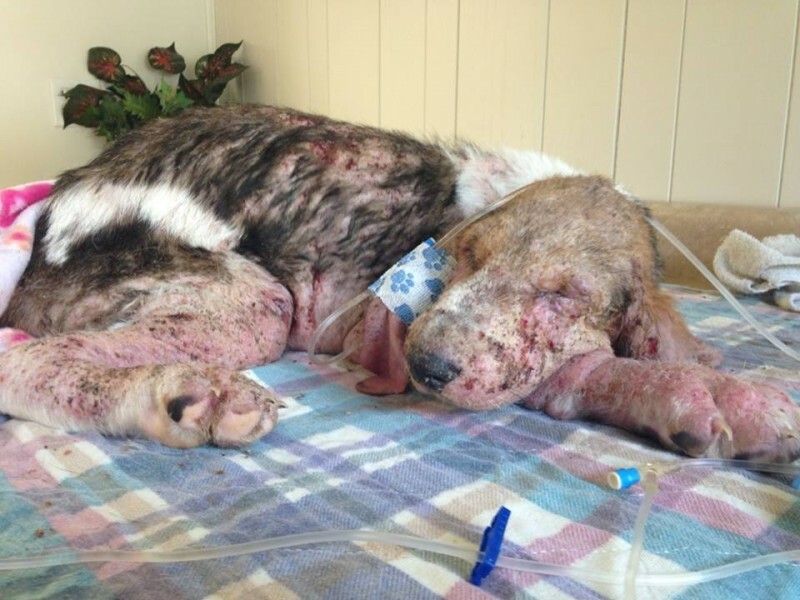 Watkins remained at the vet for 119 days and even spent some time in ICU. During this time, he fought his way back to life, which is simply unbelievable. Stephanie wrote about the small puppy on the internet. Thousands of people around the world were then able to take part in Watkin's fate. 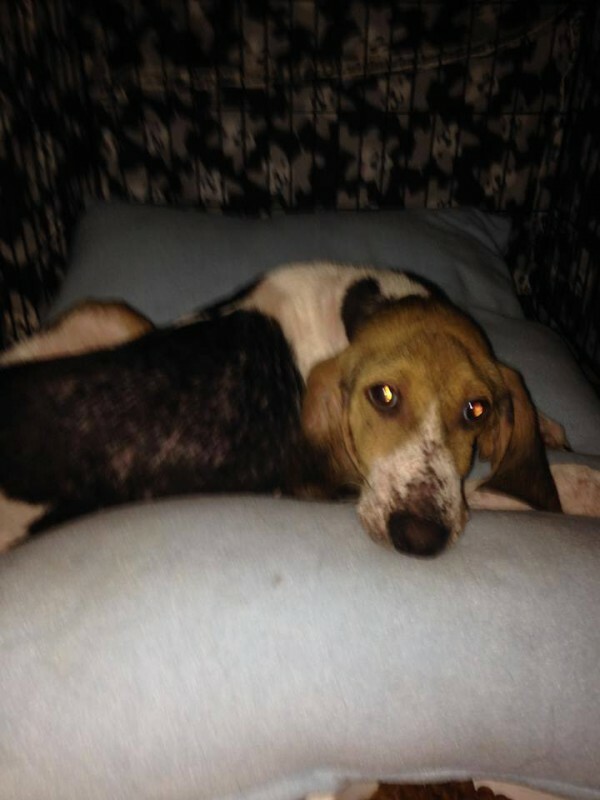 They sent dog beds and blankets from all over, in order to support Watkins. Meanwhile, his Facebook page has over 12,000 followers. Stephanie is not sure why so many people took an interest in Watkin's story. "His pictures and his history must have stirred something in them. That's what it was like for me", she said. And thanks to all the great support that Watkins received and to his enormous team of helpers, he was finally allowed to go home with Stephanie on July 11, 2015. 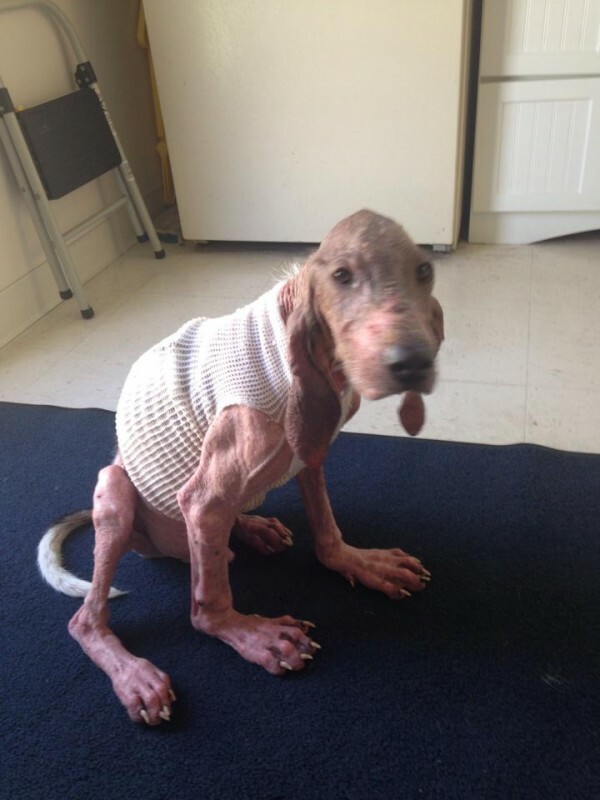 Of course, he was not completely freed from the doctor visits, as he still had an ear infection; due to the demodectic mange, he is still receiving a kind of "puppy-chemo." Watkins gets a little better every day. Because his legs don't function correctly, Stephanie wanted to take him to a specialist doctor, but just before she did, the little dog made a gigantic step forward: "He simply stood up and walked exactly how he should. I have no explanation as to why." 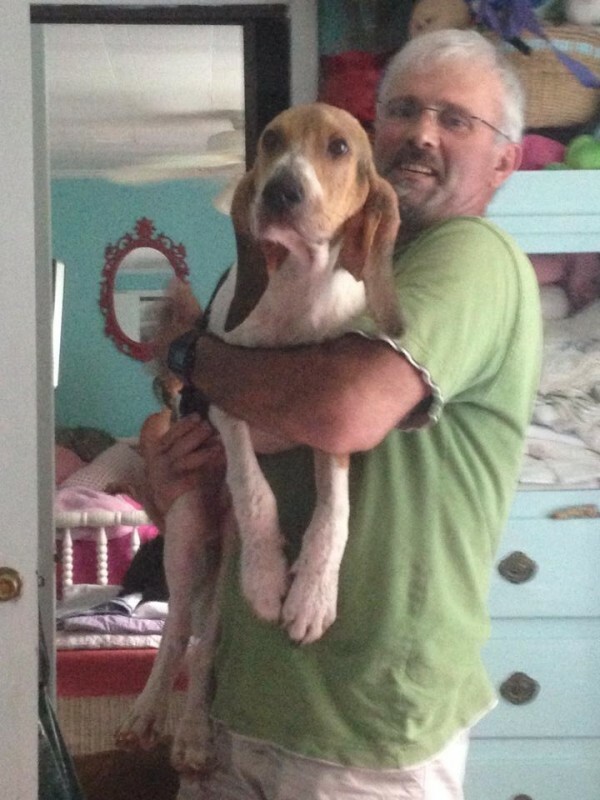 He is a lovely dog, who and, even though he was scared of car rides at the beginning, is now an enthusiastic rider. Even though the first few months of his life were so terrible, he has so much love to give, and not only to his human companions but also to his animal friends. When Stephanie rescued a cat and her kittens - the small family wandering around the animal shelter covered in soot - Watkins immediately took the cats under his wing, licked them clean and cared for them. 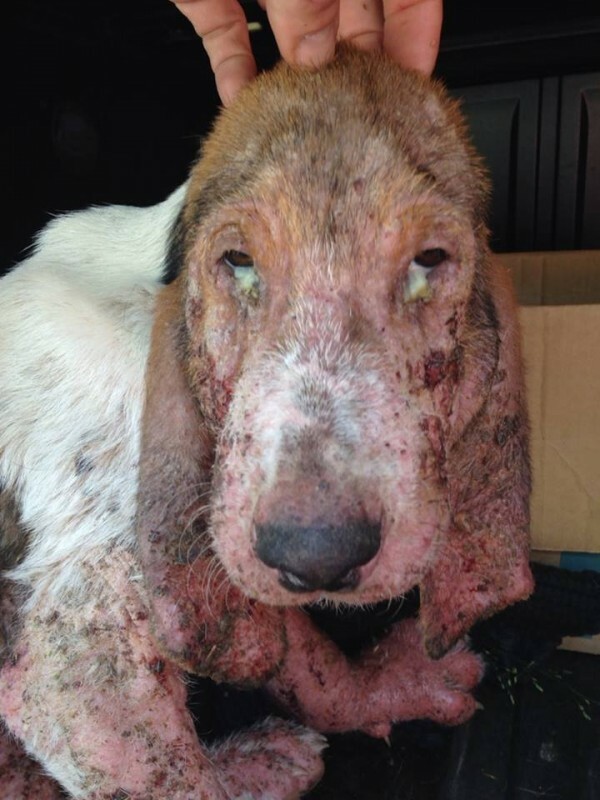 "The vets at the animal hospital told me that they had all hoped and prayed for him, but that he didn't have a very high chance of survival ... he surprised us all," said Stephanie. "He's a wonder, he really is." 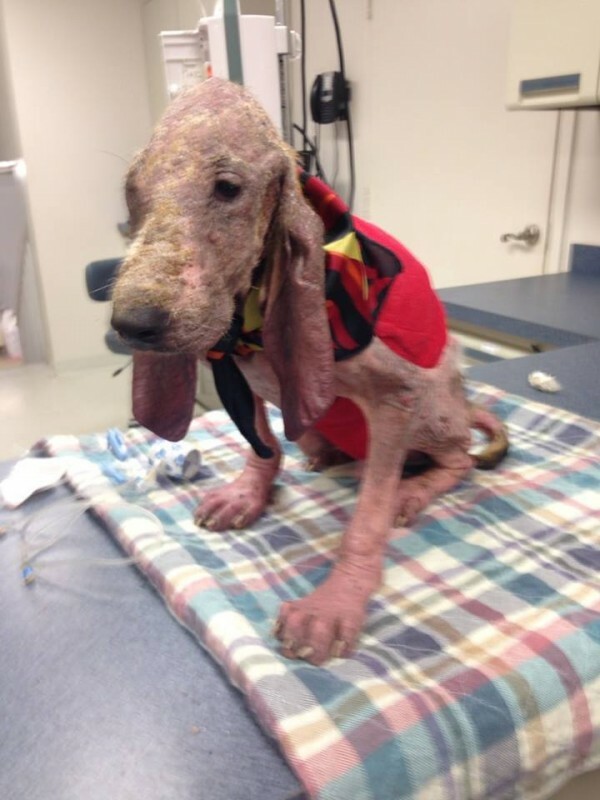 Watkins is the best example for the fact that one should never give up on animals, regardless of had bad their condition. He was nearly dead and is now back on his feet. This sweetheart is really a wonder-dog. 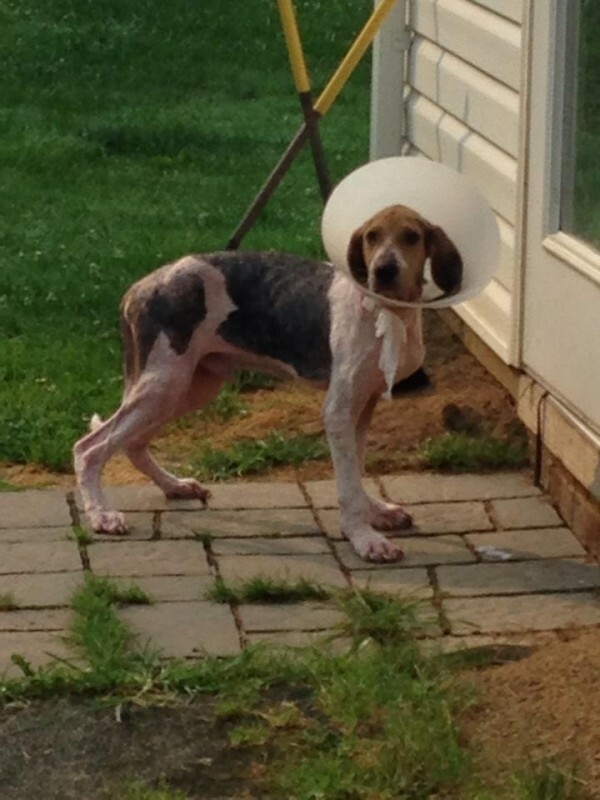 SHARE this incredible story of a real fighter dog with everyone you know. 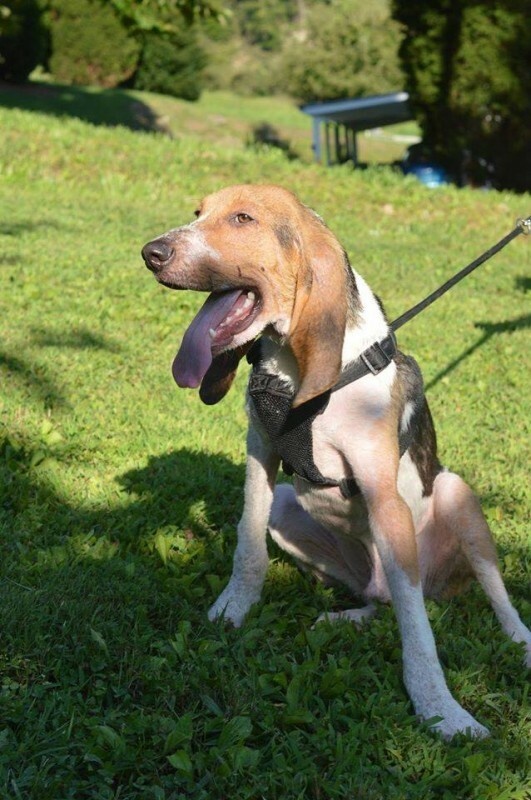 More dogs like Watkins should be saved, because they all have the right to a life.